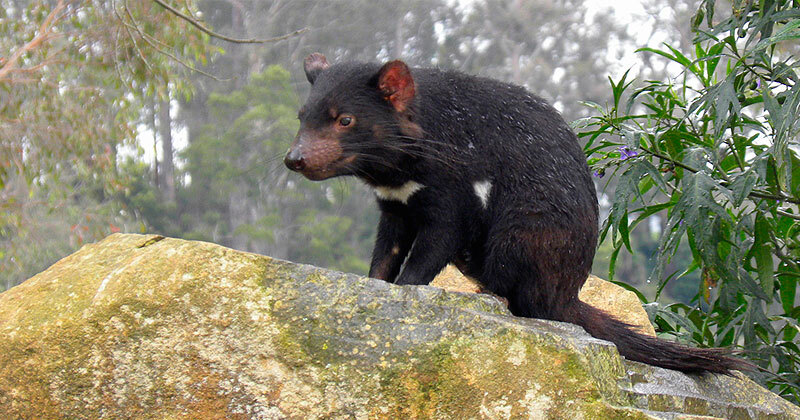 A peptide (a chain that can form proteins) found in Brazilian researches is being applied in international studies seeking the cure for a disease affecting the Tasmanian devil, a marsupial mammal living on the Australian island and facing extinction. The biggest threat to the animal — known worldwide because of Taz, the animated cartoon character— is the facial tumor disease, and the molecule which is viewed now as a hope for the treatment was discovered in a doctoral research study conducted at the USP Biomedical Science Institute (ICB) in 2000. Gomesin is a peptide isolated from the blood of Acanthoscurria gomesiana, a spider found in São Paulo State. This molecule has strong antimicrobial properties. “We have in our blood antibodies which help defend us from diseases, and these simpler animals also have their substances which protect them”, explains Pedro Ismael da Silva Junior, a professor from the Inter-Units Graduate Program in Biotechnology at ICB and a researcher at Butantan Institute. The peptide has already been proven efficient against fungi, viruses, bacteria and some types of cancer. Proteins or peptides with antimicrobial properties are those capable of identifying cells or agents foreign to the animal system and destroying them. Those molecules can act in two ways, according to Silva Junior: by breaking into the cell wall of the foreign agent, breaking down its internal content and causing it to die, or getting into the microorganism and causing internal damage, such as inhibiting the production of other proteins. The search for new medicines from venomous animals is something very common in the academic world. The specific interest in spiders is due to the fact these animals have undergone little evolution. The professor explains spiders are animals which appeared 400 million years ago, and comparing them to spider fossils revealed they have experienced little evolutionary changes since then, despite living in places heavily populated with microorganisms, such as fungi and bacteria. Add to that the fact they are periodically exposed to those agents as they grow, as the arthropods, the phylum arachnids belong to, have an external skeleton (exoskeleton).That means spiders need to change their exoskeleton to grow, making them vulnerable to external agents until a new skeleton has hardened. Then, as they have survived for so long with such little changes, these animals have a good defense system acquired from the process of natural selection, which made them so resistant against diseases and foreign agents, explained Professor Ismael Silva Junior. The disease affecting Tasmanian devils is the Devil facial tumor disease (DFTD) or Tasmanian devil facial cancer. DFTD is a type of cancer highly contagious among those animals, characterized by lumps of soft tissue on the face, mainly around or inside the mouth and nose. These tumors grow, spread, destroy the faces of the Tasmanian devils and impair feeding, and eventually lead to death by starvation. It is a rapidly progressive cancer observed in 65% of the island of Tasmania. The cure for the tumor may save this species from extinction.